If your face shows signs of photo aging, such as mottled skin or red spots, intense pulsed light (IPL) can help even out your complexion. At MD Advanced Skincare, you receive your laser treatments in a luxury medspa environment in Houston, Texas. In under 30 minutes, you can be pampered on your lunch break and return with rejuvenated skin. Book an appointment for IPL online or over the phone. Intense pulsed light (IPL) is a noninvasive procedure using high-intensity light to treat skin discoloration and imperfections associated with sun damage and aging. 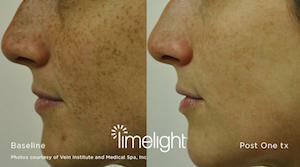 IPL targets redness and pigmentation to even out your complexion. MD Advanced Skincare uses Cutera® LimeLight IPL technology to provide cutting-edge clinical facials. This high-tech treatment repairs a multitude of imperfections and restores some of your skin’s youthfulness. What problems does IPL treat? The specialists at MD Advanced Skincare perform most IPL treatments on the face and neck, but IPL is also appropriate for the chest, hands, arms, and legs. If you’re worried about pain, your specialist may have you apply topical anesthetic in the hour before the procedure. They also apply a cooling gel to the skin and gives you safety glasses to wear during the treatment. Then, your aesthetician cleanses the treatment area and may take a “before” picture to monitor your results. While you relax on the exam table, your aesthetician glides the IPL handpiece over your skin, treating each section in increments. They place cooling pads on your skin to offset the effects of the heat. The entire process takes 20 to 30 minutes to complete. You may experience some swelling, redness, and increased pigmentation for a few hours or days after treatment. However, the pain dissipates quickly and the brown spots peel off as a new layer of skin appears underneath. What are the benefits of IPL treatments? IPL is a safe, effective way to improve skin tone. Ask the professionals at MD Advanced Skincare to see their “before and after” gallery to see how effective IPL treatments are for their patients. You can also expect a rapid recovery after IPL treatments. The temporary discomfort you might feel after the procedure shouldn’t prevent you from returning home or to work right after your appointment. To find out if IPL is right for you, schedule a consultation at our Houston, Texas, spa over the phone or using the online scheduler.